Tuesday’s mission was Japan’s second dedicated commercial launch, following 2015’s deployment of Telstar 12V for TeleSat Canada. Like the Telstar launch, this used an H-IIA rocket flying in its heaviest configuration, the H-IIA 204. Despite its payload being commercially owned, it will be operated on behalf of the Japanese government to provide military communications. Due to its military applications, Japan has released fewer details about the launch than for many recent missions. The payload, DSN-2, will be operated by DSN Corporation, a joint venture between the SKY Perfect JSAT Group, NEC and NTT Communications. It is the first satellite to be launched for DSN, which aims to provide military communications services to the Japanese armed forces until at least 2030. 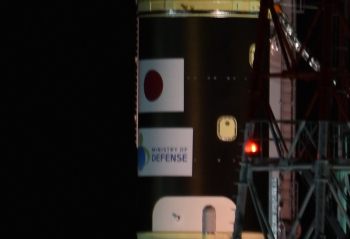 Following a Japanese tradition of renaming satellites once they have successfully reached orbit, DSN-2 will be named Kirameki 2 when it enters service. DSN aimed to begin operations in March 2016 following the launch of DSN-1, a hosted payload aboard JSAT’s Superbird 8 satellite which was slated for launch in December 2015 atop an Ariane 5. This launch slipped into mid-2016 before the satellite sustained damage during transportation to its launch site in Kourou, French Guiana. The spacecraft is currently undergoing repairs and is not expected to launch until 2018. DSN-2 is launching as scheduled in January 2017. The spacecraft was developed by NEC around a DS-2000 bus produced by the Mitsubishi Electric Corporation (MELCO). It carries an X-band communications payload and is designed for at least fifteen years of service. The longitude at which DSN-2 will operate has not been published, however this will likely be determined by amateur observers once the satellite is on station if it is not published officially in advance of this. DSN-1, once it launches, will operate at 162 degrees east. 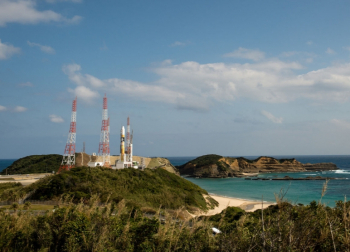 Tuesday’s launch took place from pad 1 of the Yoshinobu Launch Complex at the Tanegashima Space Centre. Built for the H-II in the early 1990s, Yoshinobu is a two-pad complex – with the first pad used for the H-IIA and earlier the H-II, while the second pad – originally constructed as a backup for the H-IIA – used by the H-IIB vehicle. The H-IIA is the mainstay of Japan’s launch fleet, which also includes the larger H-IIB and the smaller – solid-fuelled – Epsilon. First flown in 2001, the H-IIA replaced the earlier H-II with the goal of reducing launch costs and improving reliability. The H-IIB – used exclusively to orbit the H-II Transfer Vehicle (HTV), or Kounotori, on missions to the International Space Station – is derived from the H-IIA but features a wider first stage with two engines. Epsilon uses as its first stage the SRB-A3 booster which is used as a strap-on for H-IIA launches. A new rocket, the H-III, is currently slated to fly in 2020 as an eventual replacement for both the H-IIA and H-IIB. The launch of DSN-2 was the thirty-second flight of the H-IIA and the third to use the 204 configuration. The first of the three digits in this designation gives the overall configuration of the vehicle – a 2 denoting the standard H-IIA first and second stages; a 3 would denote the enlarged H-IIB first stage. The second digit gives the number of liquid-fuelled boosters attached to the first stage; such a booster was proposed at an earlier stage in the program but never developed, so this digit is always zero. The third digit gives the number of SRB-A3 – earlier SRB-A – solid rocket boosters. Until 2008, smaller Castor-4AXL boosters – designated SSBs – were also used on the H-IIA; if these were present a fourth digit was added to the end of the configuration to indicate the quantity of these boosters. The four configurations which have flown are the 202 – which uses two SRB boosters, the 2022 and 2024 with two SRBs and respectively two and four SSBs and the 204 with four SRBs and no SSBs. The Castor was abandoned following enhancements to the SRB-A boosters, and the 2022 and 2024 vehicles made their respective final launches in September 2007 and February 2008, with the Kaguya (SELENE) lunar probe and the Kizuna (WINDS) communications satellite. Under the same designation schema, the H-IIB flies in the 304 configuration. Built and operated by Mitsubishi Heavy Industries, the H-IIA is a two-stage vehicle with both stages fuelled by cryogenic propellant; liquid hydrogen oxidized by liquid oxygen. A single LE-7A engine powers the first stage, while the second stage powerplant is an LE-5B. The four solid rocket boosters are SRB-A3s, an enhanced version of the SRB-A motors which were used up until 2008, clustered around the base of the first stage. For Tuesday’s launch the rocket will fly with a 4S-type payload fairing – a short four-metre shroud which the smallest fairing used on H-IIA rockets. 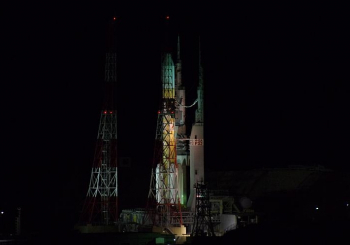 Prior to Tuesday’s launch, the H-IIA has made two flights in the 204 configuration. The first of these, in December 2006, placed the Kiku 8 – or ETS VIII – satellite into geosynchronous transfer orbit. An experimental communications satellite, Kiku 8 was retired after ten years’ service on 10 January. The second H-IIA 204 launch came in November 2015 with Telstar 12V. In over fifteen years’ service and thirty-one launches to date, the H-IIA has only experienced one failure, which occurred on its sixth flight in November 2003. During that launch – using the 2024 configuration to carry a pair of reconnaissance satellites to orbit for Japan’s Cabinet Satellite Intelligence Centre – one of two SRB-A motors failed to separate from the first stage after burnout. The additional mass of the spent motor affected the rocket’s performance and the vehicle was later destroyed by range safety once it became clear that it was not able to achieve orbit. The H-IIA’s most recent flight, last November, carried the Himawari 9 weather satellite to geosynchronous transfer orbit. 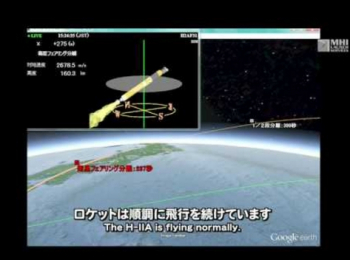 A flightplan for Tuesday’s launch, using H-IIA vehicle F32, had not been published and there was no official webcast. The mission could follow a two- or three-burn profile to achieve geosynchronous transfer orbit. In either case, events up until second stage ignition are likely to be roughly the same as any mission. During the Telstar 12V launch aboard H-IIA F29 – the most recent use of the 204 configuration – ignition of the first stage LE-7A engine occurred shortly in advance of the zero mark in the countdown – designated X-0 under Japanese nomenclature – with SRB-A3 ignition and liftoff at X-0. The SRB-A3 motors burned for about 116 seconds, separating in pairs eleven and fourteen seconds later. Four minutes and ten seconds after liftoff, the payload fairing separated from the nose of the rocket. Burnout of the first stage occurred about six minutes and 40 seconds after liftoff, with stage separation eight seconds later. During the Telstar launch the second stage ignited six seconds after staging, beginning the first of three burns. This first burn lasted four minutes and 13 seconds, followed by an eleven-minute, 29-second coast. The second burn lasted four minutes and one second, before an extended three-hour, 55-minute and 53-second coast as the rocket climbed towards apogee. The final burn at apogee lasted one minute, with spacecraft separation about three and a half minutes after the end of powered flight. Had the DSN-2 launch called for a three-burn profile, similar mission events would have occurred during Tuesday’s launch. However, the timings were likely to become increasingly different as the flight progresses due to differences in mission requirements and payload mass. In the end, timing of the milestones showed this was a two-burn mission profile, with the second stage making a longer first burn and potentially a slightly shorter second burn, with a longer coast between these burns but omitting the long coast to apogee and the burn after this coast phase – although the exact parameters would again be subject to the mass of the payload and the requirements of its target orbit. Under this two-burn mission, spacecraft separation occurred within half an hour of liftoff. Tuesday’s launch was the sixth of 2017 worldwide and the second for Japan – following an unsuccessful experimental launch earlier this month which attempted to place a CubeSat, TRICOM-1, into orbit using a modified SS-520 sounding rocket. Japan has a busy launch schedule for 2017; believed to include three H-IIA flights with new spacecraft for the Quasi-Zenith Satellite System (QZSS) navigation project, two with IGS reconnaissance satellites and one to deploy the GCOM-C climate research mission, as well as Epsilon launches with the ASNARO-2 radar imaging satellite and a technology demonstration mission. 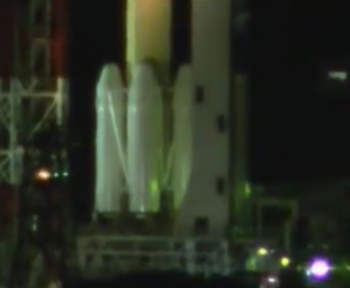 It is not currently clear which of these will be the next to launch, or when that launch will occur. 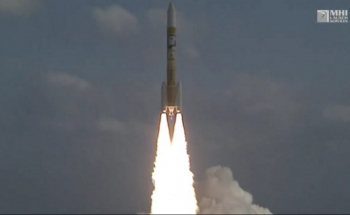 To date, Japan’s fastest turnaround between two H-IIA launches has been 25 days, between the launches of the Daichi (ALOS) and Himawari 7 (MTSAT-2) satellites in January and February 2006.